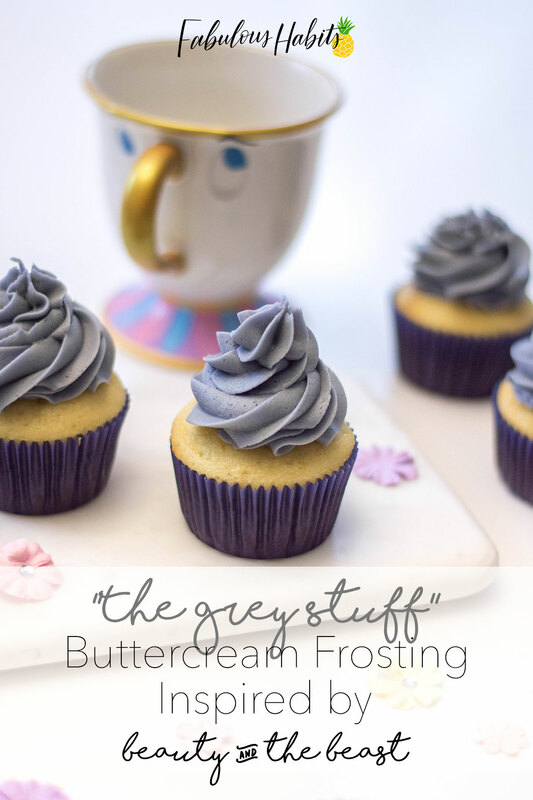 Making Lumière proud and re-creating buttercream ‘grey stuff’ – and you know what? It really is delicious! Beauty and the Beast was my first favourite Disney movie. That list of favourites has expanded over the years (I’m looking at you, Mulan and Moana). I remember as a four-year-old, my aunt gifting me a VHS copy for the holidays. 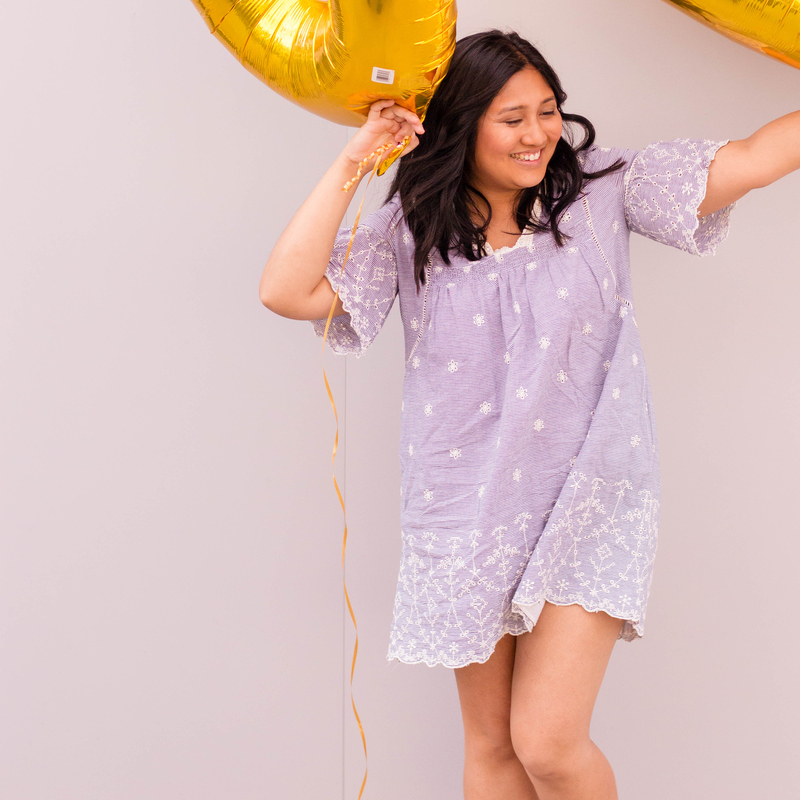 I was ecstatic and so obsessed with it that shortly after, my mother sewed me a large yellow dress for my next birthday party. 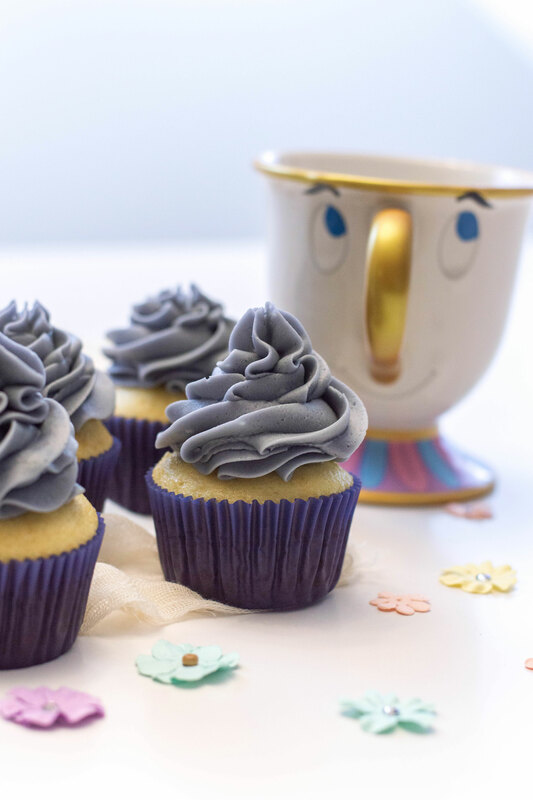 To pay homage to the movie’s beautiful ‘Be Our Guest’ scene, I whipped up these vanilla cupcakes, topped with my classic homemade buttercream. This buttercream is the star player for many of my desserts and I’m happy to share that recipe with you today. Using a stand mixer, start beating butter, confectioners’ sugar, and milk on slow. As the ingredients start to mix, slowly increase the speed to high. Add gel food colouring and continue beating until the consistency is thick and forms stiff peaks. If you find your buttercream is too runny, add more confectioners’ sugar, one tablespoon at a time. If too thick, you may add milk, ½ tbsp at a time. 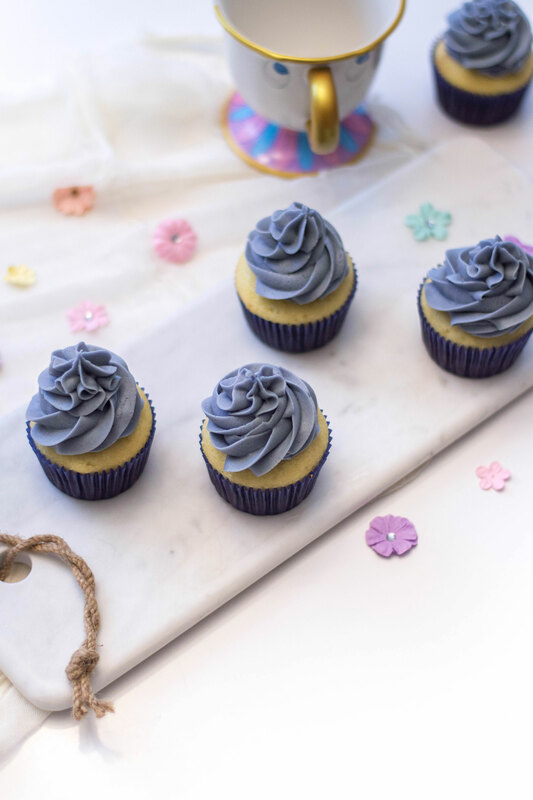 Scoop the buttercream into a piping bag and frost each cupcake generously. Tell me your favourite Disney movie in the comments below! How cute are these?! They make grey look good! Your pictures are so sweet with the Chip cup! I remember trying the grey stuff at Disney World and it was so fun. These are so pretty! I have a friend who is obsessed with Beauty and the Beast. I’m going to make these for her birthday! 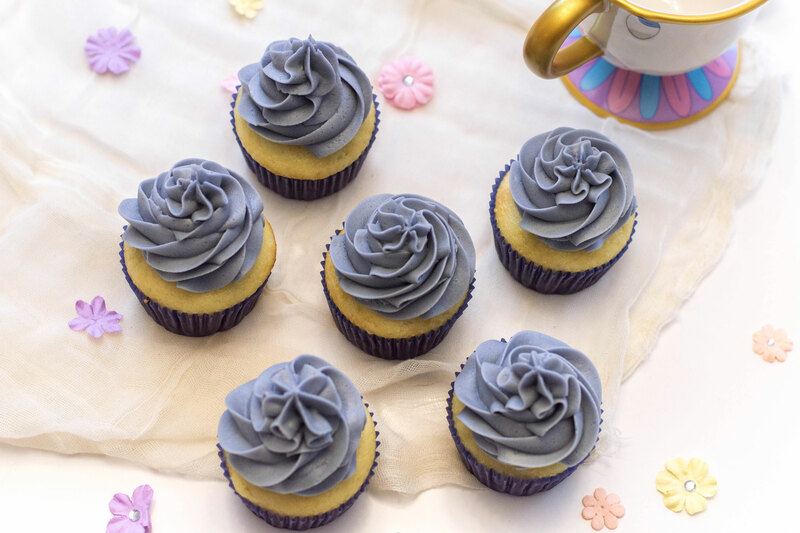 who knew gray frosting could look so delicious?! I wish I could bake, I’d totally try to make these! These look so good. 10,000 bonus points for the cute photos with Chip! Aw, Beauty and the Beast was my absolute FAVORITE childhood Disney movie! What I would have given to have some of “the grey stuff” while I was watching it! I wanna try the “gray stuff”. I love frosting and Beauty and the Beast. Your cupcakes are too cute! This is really adorable and looks delicious! Would love to give it a try! Your pictures are gorgeous and the cupcakes are perfect! Such a pretty grey color! Oh these look just amazing. Such gorgeous photos and the buttercream looks just fantastic. So perfect. Great recipe! I will have to try this with my niece next week! I can’t believe beauty and the beast came out 27 years ago! I love how you got this colour in your icing, looks intruiging and delicious. Your cupcakes turned out beautiful. You did a great job. I always buy store bought because I was intimidated by making my own. This looks like an easy recipe I will have to try. 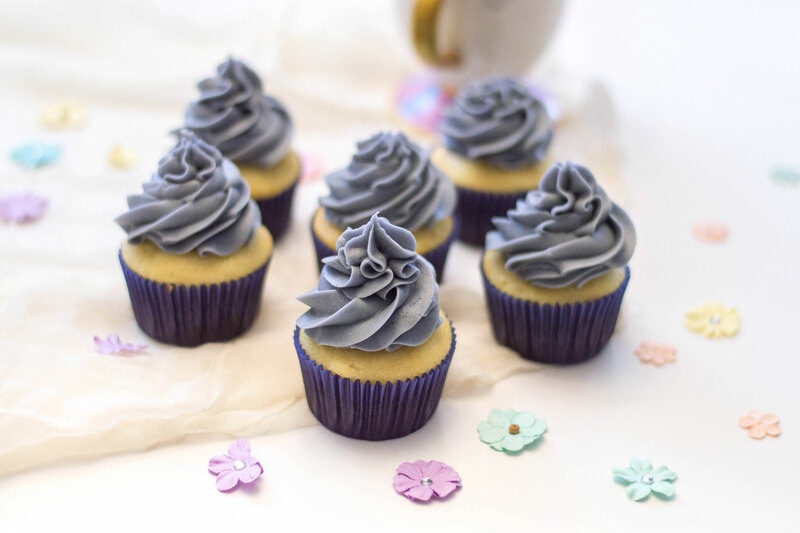 Buttercream frosting is delicious! I love that it can be made almost any color you need to decorate with. These turned out great. Beauty and the Beast is my favorite Disney movie! These cupcakes look like a yummy treat for a movie watching party. The grey stuff does look delicious! my goodness the frosting looks so yummmy 😀 Love, love, love the color and finish you gave it!! !